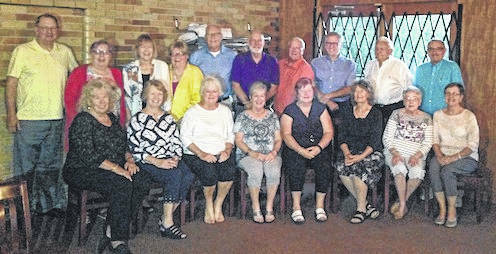 The Mount Gilead High School class of 1963 held its 55th reunion at The Warehouse Italian Restaurant in Marion Sept. 15. Attending were, first row, from left, Sandy Rhodebeck Decker, Linda Furniss Erwin, Ronda Rathburn Creese, Barb Higgins Rhoads, Myra Ward Beech, Judy Orsborn McKirgan, Carol Lee Mann, Bonnie Dilsaver Brannon. Second row, John Rexford, Jane Hunt Redmond, Donna Shade Hull, Curl Williamson, Tom Ansley, Bob Shoaf, Jerry Ashbrook, Keith Early, Dave Decker, Dave Nicholson.